VSee is the largest video telemedicine platform, combining HIPAA secure video chat, EMR screen sharing, and medical device streaming. VSee has recently partnered with PTZOptics a US-based camera manufacturer to integrate Pan, Tilt, Zoom camera control into its secure telemedicine platform. The PTZOptics USB camera line supports absolute UVC control allowing VSee to control mechanical PTZ functions through a simple USB connection. Doctors working remotely can zoom into particular areas of interest during a telemedicine call, such as for telestroke, burn, and trauma cases. VSee also has a simple Virtual Waiting Room; advanced features include scheduling, call routing/triage, online payment, ePrescribe, and FitBit integration. Building complete camera control for Telemedicine into these platforms opens new functionality for robotic telemedicine. PTZOptics encourages third parties like VSee to integrate camera controls into their software by providing open source controls, SDK’s and various standard protocols. 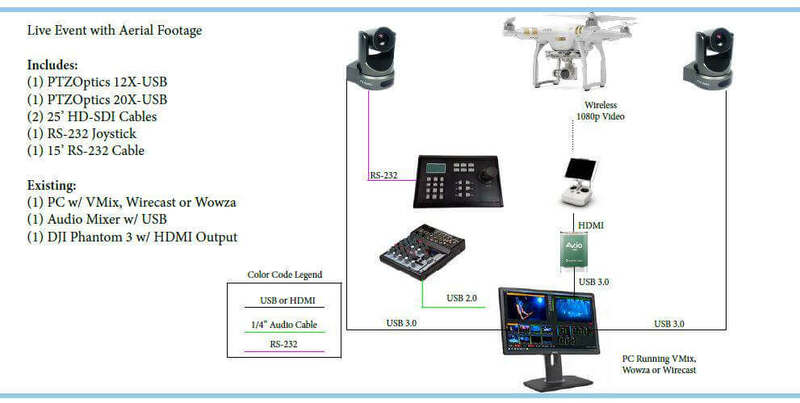 Companies such as NewTek, RocoSoft, and Zoom Video Communications have already integrated similar projects for native camera control in their video communication programs. VSee is the first telemedicine-focused software to integrate secure camera controls with PTZOptics. VSee has been used by Hillary Clinton, Angelina Jolie as well as President Obama’s security team during his Inauguration. PTZOptics robotic camera control will help extend the reach of telemedicine everywhere. Hello Telemedicine & Healthcare Professionals! 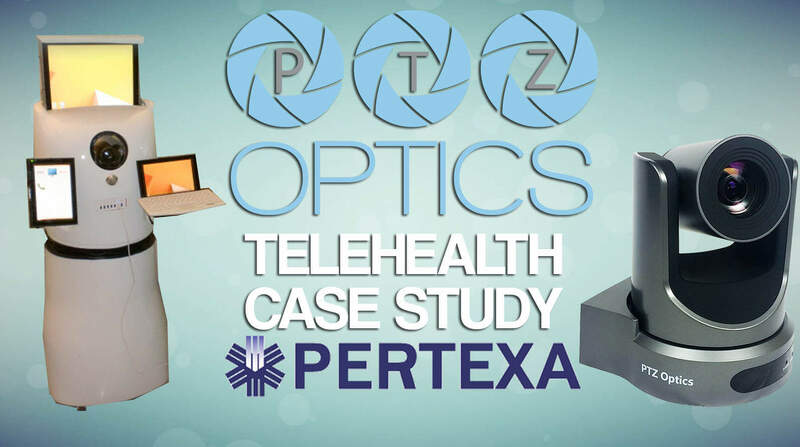 Pertexa Healthcare Technologies, Inc, the California-based telemedicine organization reports they have chosen PTZOptics mechanical PTZ cameras for their primary telehealth soltuion RITA (Remote Intelligent TeleHealth Assistant). 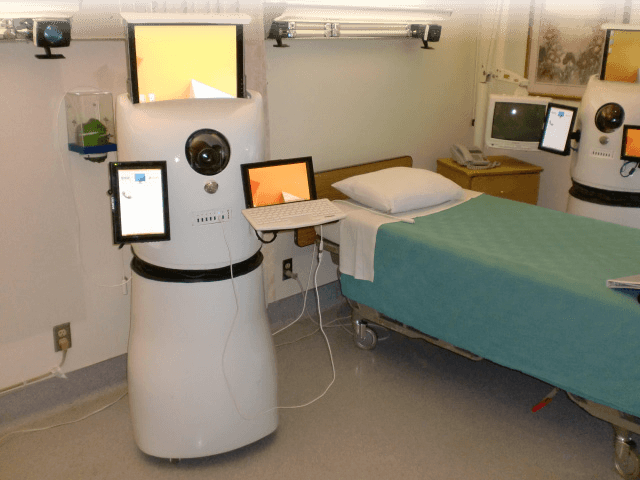 These telemedicine robots use cutting edge advancements in telehealth technology to take full PTZ camera control remotely from their secure telemedicine software. The specialties will include dermatology, cardiology, pain management ,OB/GYN , orthopedic and primary care. PTZOptics USB camera line provides UVC control permitting Pertexa to control the automated PTZ controls through a straightforward USB connection with RITA. This permits specialists working remotely to intertact progressively with patients while zooming into specific regions of interest for telemedicine professionals. RITA permits specialists to remotely assess the seriousness of a sickness or harm and focus the best game-plan for healthcare professionals. Doctors control the camera to analyze patients remotely and have prompt access to electronic well being records, EKG results, circulatory strain and oxygen readings, and other gear used to therapeutically analyze a damage or disease. Pertexa, Inc. is a cutting edge telehealth organization headquartered in Ridgecrest, California fostering the innovation which created R.I.T.A. (Remote Intelligent TeleHealth Assistant) and Radekal, the country’s driving Physician’s Productivity Tool. 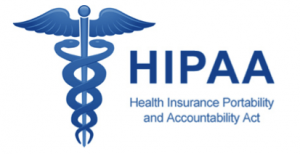 Pertexa has been perceived as a standout amongst the most creative medicinal innovation organizations in America and works with driving restorative offices in California to enhance and progress country social insurance. Pertexa, Inc. is a next-generation medical technology company headquartered in Ridgecrest, California that creates and distributes advanced technology including RITA and RADEKAL, the nationʼs leading Physicianʼs Productivity Tool, which has been shown to increase productivity by 30%. By combining both hardware and app development for worldwide medical use, Pertexa is an innovative brain trust, advancing disruptive transformational technologies for an evolving healthcare environment. Hello AV & IT Pros! Matthew Davis lead engineer at PTZOptics has put together a video intro series that takes us through the core functionality of the camera line in a quick and easy video format. These video cover specific functionality and camera limitations for the PTZOptics camera line you won’t want to miss! PTZOptics becomes a Gold Sponsor for Streaming Media West! 10/8/2015: Streaming Media West is on Nov 17-18 at the Hyatt Regency, Huntington Beach California. PTZOptics is proud to be a GOLD sponsor of the Streaming Media West show and will be exhibiting in booth 211. Streaming media west is a great place to learn about new products for production, live streaming, OTT, content delivery and much more. 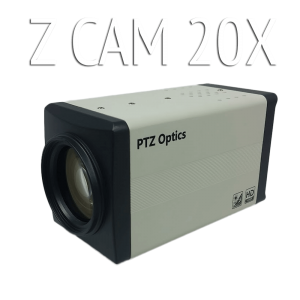 PTZOptics is a PTZ broadcast camera manufactures operating outside Philadelphia, Pennsylvania. Offering four PTZ cameras with HD-SDI, HDMI, USB 3.0 and IP Streaming video outputs. PTZOptics claim to fame is “simultaneous streaming” offering three HD 1080p/30 video feeds available on every camera. 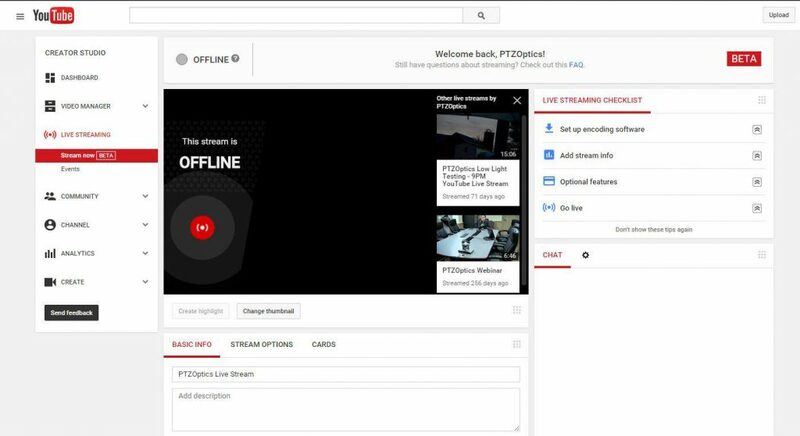 PTZOptics host live webinars every friday that are broadcast using YouTube Live’s new free streaming service. 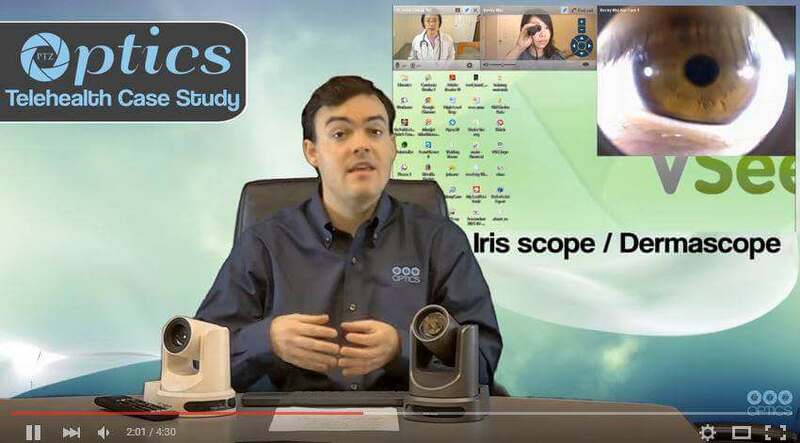 “Our broadcast is unique because we stream our interactive webinar so anyone can join in the live stream with video and audio controls.” PTZOptics uses Zoom video conferencing to host webinars every friday which are then streamed to youtube live using a RTSP feed from vMix’s live broadcasting software. Attend the next PTZOptics Live stream every Friday at 11AM PST & 2PM EST and don’t forget to stop by Streaming Media West Nov 17-18th to see our exciting booth exhibition. 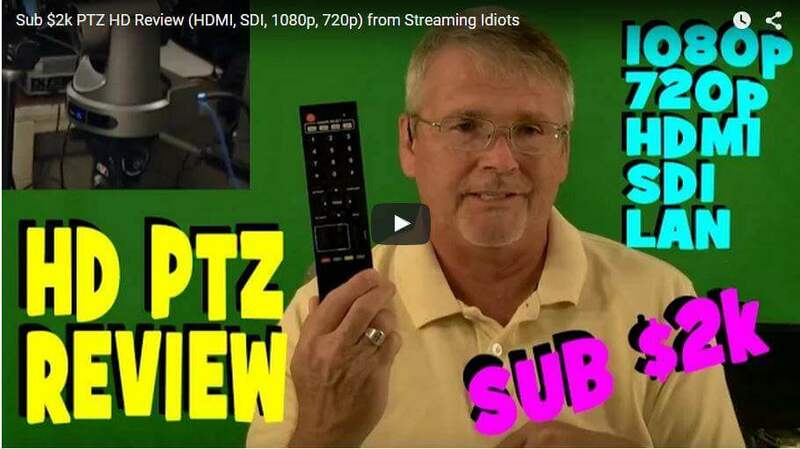 Tom from Eastern Shore Broadcast recently reviewed his PTZOptics 12X-SDI. This honest review and test footage speaks for itself. You can learn more about Tom Sinclair at www.EasternShoreBroadcasting.com at their website. You can also follow Tom at @VidblasterGuy. Tom does great broadcast and live streaming reviews that are straight forward and knowledgeable! 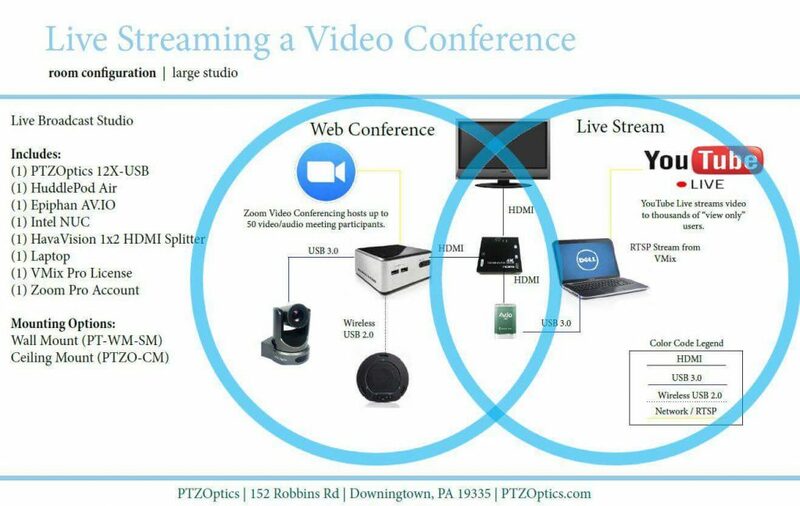 Always looking for new ways to make use of video conferencing and live broadcasting technologies, PTZOptics has put together a how to guide for “Live Streaming a Video Conference with YouTube Live”. So what does this actually mean? Well if you run a lot of video conference calls you may find that sometimes you have a important video conference call that you need to broadcast to a large audience. Most web conference solutions max out distribution at 3,000 “view only participants” but live streaming services like YouTube Live can broadcast to tens of thousands. The best part is that YouTube Live is completely free and with this tutorial you may actually find it easy! First of all let’s check out the configuration diagram we have above. This system does require two computers which is actually something of a industry “magic trick” when it comes to live broadcasting. Live streaming pioneers such as Stephen Heywood, lead technician for Wirecast and host of the “Tech Buzz” have been using this technique for a long time to host live broadcasts and pull in guest speakers over Skype. In this demonstration we are taking that concept a little further with Zoom Video Conferencing which supports up to 50 live video participants and connecting that conference with YouTube Live. I would say the Epiphan AV.IO is a the key to this system because it takes the HDMI audio and video from the computer running your video conference and brings it into your “production/broadcast” computer with super low-latency. The Epiphan AV.IO keeps all the audio and video in sync and provides a affordable (Only $349) solution for bringing a digital video source into your production. The other “secret sauce” to this live production is VMix which provides a great way to bring everything together and stream to YouTube Live. 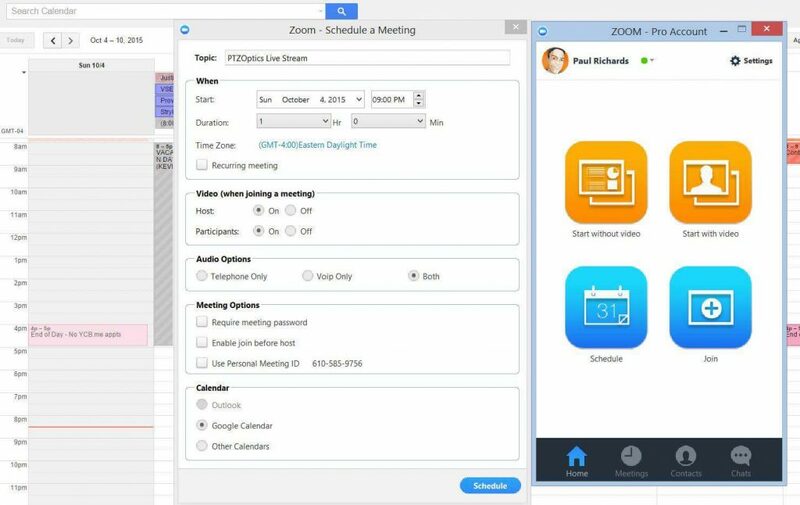 If you are host of the video conference or a participant you will be able to use Zoom just like any other conference. This is a great thing to learn how to do. Once you start live streaming with YouTube Live it will become instantly familiar. If you have ever used YouTube it’s going to be a piece of cake. Also, once your done setting up your live stream you can embed the live stream just like a YouTube video! Scheduling a Zoom video conference call (or your preferred web conferencing service) is usually the same process. You simply click schedule which creates your meeting invitation that you can use your calendaring system (Google Calendars or Microsoft Exchange) to schedule and invite your attendees. You can skip this step if you want to but I think it’s one of the best features of YouTube Live. No video conferencing service gives you the power to embed your conference right into a webpage. Here is an example of how PTZOptics uses the YouTube Live embed feature for weekly broadcasts. This is where the magic happens. 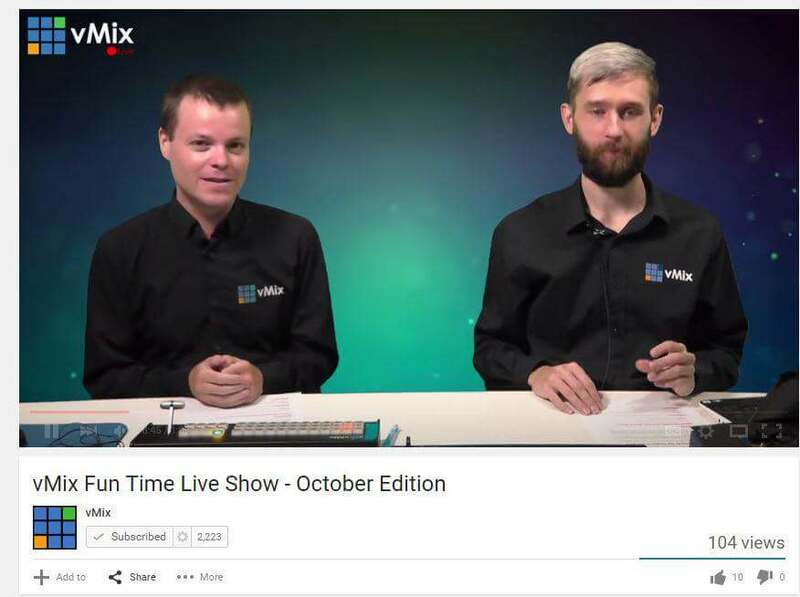 vMix could not be easier to stream live content directly to YouTube Live (you can also use Wirecast). In the picture above I have pasted the RTSP URL and the stream key given by YouTube Live. As you can see in the background I already have my live broadcast set up and ready to stream. 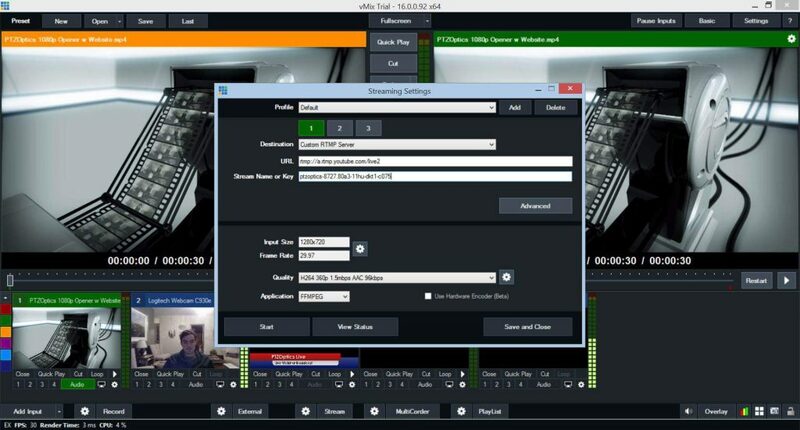 With vMix or Wirecast you can set up video clips and layover to give you stream that professional broadcast look. Press Go on your live stream! There are currently two ways to stream live on YouTube Live. You can “Stream Now” or schedule a streaming event. They are both pretty straight forward. They both have access to the video control room but the “Stream Now” basically starts an instant stream and “Events” allows more control for promoting your event. I would highly suggest scheduling your event in advance and using the live control room to preview your live stream. This way you can double check everything looks good with your live stream before your event starts. So that’s pretty much everything, step by step. 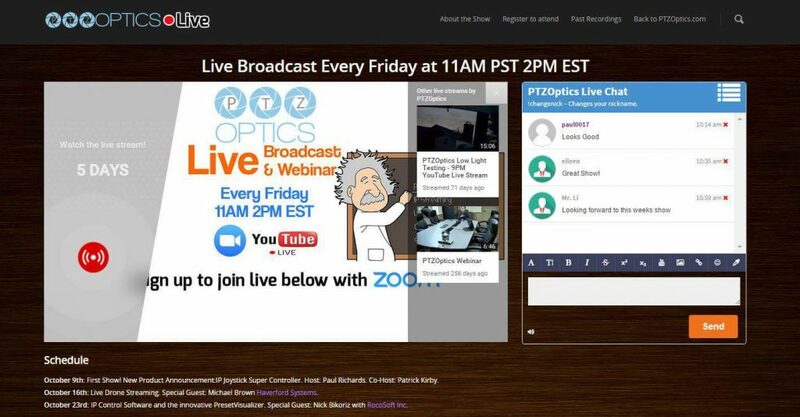 If you have any questions please reach out to us or tune in every friday for our PTZOptics Live broadcasts. This is the format we use so you can see it live and join the video conference to be live participant and ask questions. Ability to stream to large audiences absolutely free! This set up isn’t as easy as a simple webinar. That being said it is much more powerful and extends the maximum capacity of normal webinar. You asked and we listened! PTZOptics has an exciting new pair of products that are now shipping! 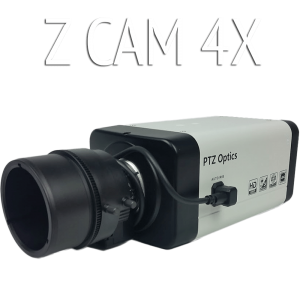 The PTZOptics ZCam 4X & ZCam 20X are the latest additions to the PTZOptics camera line. 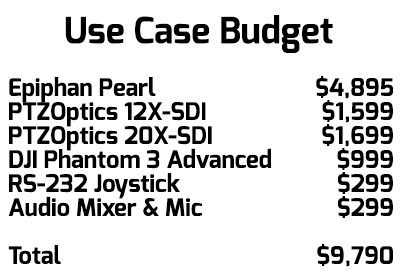 You asked for lower cost HD-SDI 1080p cameras and you didn’t necessarily need pan and tilt capabilities. The ZCam’s are perfect additions to your broadcast camera set up providing either HD-SDI or IP streaming video in full 1080p quality. As always we are providing a huge amount of flexibility. For the ZCam 4X we have a completely interchangeable variable lens allowing you to select any C/CS Type Lens available on the market. We include an ultra wide 122° angle lens which was our most popular request for only $499 MSRP! We found our customers were using our PTZOptics 12X & 20X camera options in conjunction with static cameras for ease of use. Once again PTZOptics has backwards engineered a popular HD-SDI box camera design to make it more affordable and more powerful with interchangeable lenses and network control. Our 20X ZCam is a great go-to for an affordable HD-SDI static camera shot coming in at just $799! So check out the latest specifications on the PTZOptics ZCams. Both cameras can now be found in the PTZOptics Designer for laying out your next broadcast or live streaming / video conferencing project. Don’t need Pan & Tilt? Try a ZCam! You might be wondering why PTZOptics, a PTZ camera manufacture, is live streaming with DJI drones? Well PTZOptics is known for bringing products and solutions to market faster and more reliably then the industry giants we grew up. It’s our goal to test our cameras compatibility with every major video conferencing/mixing software and hardware system in the industry. We are working with everyone from BlackMagic to NewTek in the broadcast industry and Acano to Zoom.US in the web conferencing industry. We plan to release the industries first h.265 live streaming PTZ cameras before the end of the year! When you make PTZ cameras with HDMI, HD-SDI, USB and IP streaming that means you most likely integrate with the majority of hardware and software manufactures. So it has become our job to test out technology that our end users are integrating together (Yeah, it’s a fun job). Today we are taking that initiative further by integrating a proven live streaming configuration with the Epiphan Pearl and adding the popular DJI Phantom 3 to s live streaming mix we send to YouTube Live. It’s a fun video and who doesn’t love HD aerial footage during a live broadcast? Join Our Live Streaming with Drones Webinar October 8th! In the following use cases live broadcasting may not be required. But video conferencing will improve communications. Stay tuned for our video conferencing with Drones blog post coming soon. And sign up for our webinar which will include both topics. Many other uses are available. We would love to hear your thoughts in the comments area! The use case scenario is live broadcast and professional recording. We have a PTZOptics 12X-SDI and a PTZOptics 20X-SDI connected to the Epiphan Pearl to get our wide and zoomed in shots of the live show. For those of you who are not familiar with the Epiphan Pearl, it can live stream and mix up to 4 HD video sources. In this video, we are streaming to YouTube Live with branded content and multiple pre-configured layouts that we switch between during the broadcast. 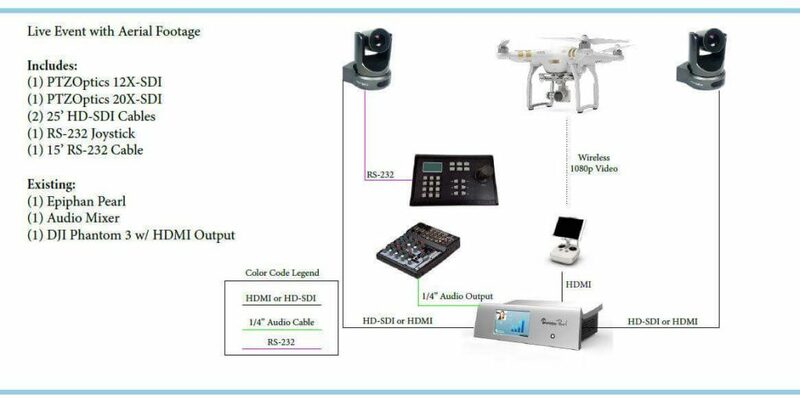 As far as the Epiphan Pearl is concerned the DJI Phantom 3 is just another HDMI input (You will need the Phantom 3 Advanced or Pro w/ the HDMI output card). To control the PTZOptics camera we are using our RS-232 Joystick controller. We chose the “old school” RS-232 joystick for a quick and easy set up. If we had more time to set up the system with a PC we would use our PresetVisualizer software for control over the network of both cameras. In fact, let’s take a look at the same scenario using VMix, Wirecast or Wowza. When we use a PC based streaming service like VMix, Wowza or Wirecast, we have switched our camera models from the SDI models to the USB models. Our desktop PC can now run our UVC control software and we have the camera preset/control software available right through our computer. Because we have HDMI coming out of our DJI Phantom 3 we will have to use the Epiphan AV.IO to convert HDMI to USB 3.0. Desktop live streaming services are extremely popular for small production studios and broadcasters who like the flexibility and low start up budget. Software streaming services also offer a lot of bells and whistles but they don’t offer the easy mobility or touch screen that the Epiphan Pearl offers. As you can see the live stream to YouTube Live and the HD recordings of the PTZOptics cameras and the DJI Phantom 3 camera out great. The Epiphan Pearl actually recorded each input independently for professional post production. All told we have a live broadcast solution that anyone can use to take professional HD video footage and stream to any major CDN.